Mimikyu in game: 1,161 Who? Important notice! 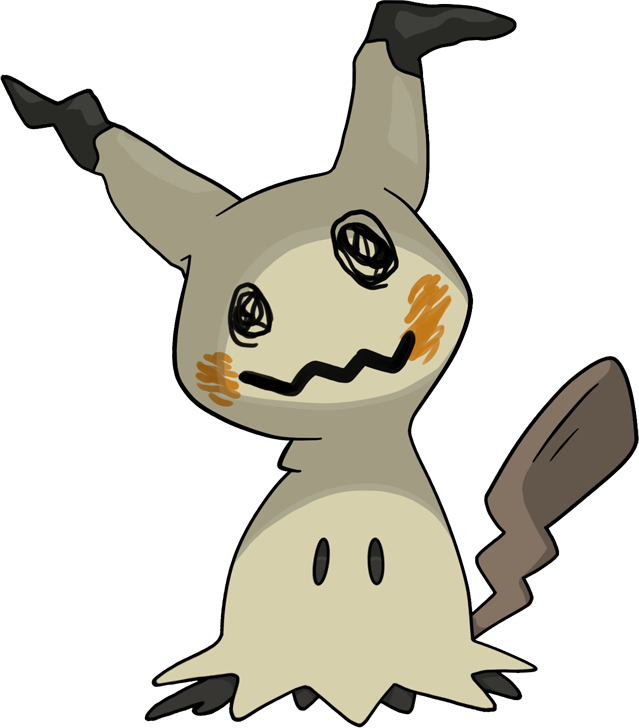 Pokemon Mimikyu is a fictional character of humans. Mimikyu (Japanese: ????? Mimikkyu) is a dual-type Ghost/Fairy Pokémon introduced in Generation VII. Mimikyu is a small Pokémon whose body is almost entirely hidden under a veil. Its beady black eyes are visible through holes in the body of its disguise, and the fringe of an amorphous foot or lower body appears to be visible under the hem of its veil. Occasionally, it will also extend a black appendage from under its veil. The veil itself resembles a Pikachu. The cloth is yellow with black tipped ears. The Pikachu face appears to be drawn with crayons, consisting of black eyes, red cheeks, and a squiggly black mouth. 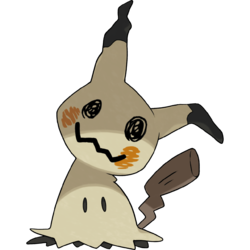 Mimikyu also carries a small stick resembling a lightning bolt to create a tail for its costume. When its disguise is damaged, the costume's head droops limply backwards, revealing Mimikyu's ruse. Mimikyu is always covered by its disguise. Since this Pokémon is weakened by sunlight, it is rumored that the veil is used for protection. It is believed that seeing its true form will cause a mysterious illness. Mimikyu's disguise is modelled after Pikachu because of the popularity of Pikachu-styled merchandise. This lonely Pokémon thought that this disguise would allow it to make friends with people. As shown in the anime, it can leave its disguise behind. Jessie caught a Mimikyu in SM004. It first appeared in SM003. Mimikyu's disguise is based on Pikachu. The execution of the disguise is similar to ghost costumes made from bedsheets. Mimikyu and Mimikkyu may be derived from mimic you.